Andrew Ladd understood the importance and significance of helping others long before he skated in the NHL. Throughout his big-league career, one spanning 12 seasons, the veteran left-winger, who has played with Carolina, Chicago, Atlanta, Winnipeg and the New York Islanders, has contributed to countless charitable organizations and initiatives. A long-time supporter of disadvantaged children and a Special Olympics advocate, Ladd was the honorary spokesperson for the Dream Factory in Winnipeg, which grants wishes to sick children. 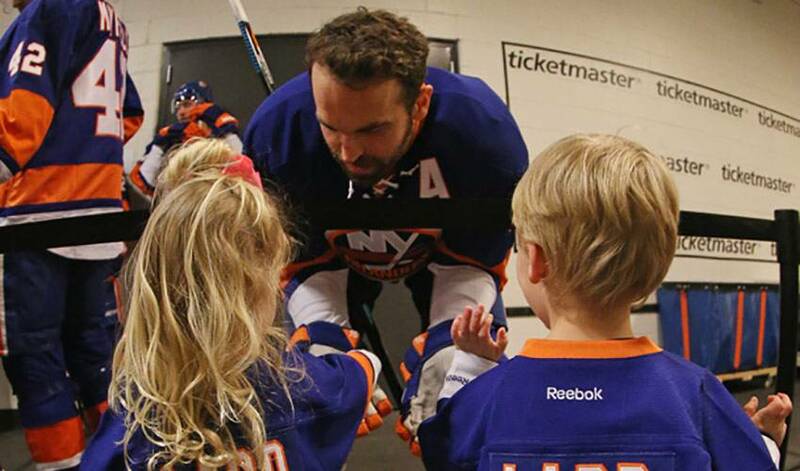 Ladd’s Leaders, created after Andrew signed as a free agent with the Islanders on July 1, 2016, allows people to nominate a young leader within the community that has made an impact, or donated their time to a worthy cause. If selected, each Ladd’s Leader gets an invite (with an adult chaperone) to an Islanders home game at the Barclays Center, and sits in Andrew’s seats for the night. In 2014-15, Ladd was nominated for the prestigious Mark Messier Leadership award. The honour recognizes an individual as an outstanding leader within their sport, and as a contributing member of society, particularly through charity. The 31-year-old, who has also supported country music legend Garth Brooks and his “Teammates for Kids” Foundation, knows first-hand just how impactful supporting others can be. Raised alongside intellectually and physically disabled foster siblings and family members, Ladd grew to appreciate their struggles and strengths. Those experiences were inspirational in the formation of the Ladd Foundation, a team effort headed by Andrew and his wife Brandy, a couple who has contributed their time and effort to several causes over the years. The foundation’s stated goal is to provide individuals with limited opportunity access to new, exciting experiences, namely through sporting events. A mother of three, Brandy received her Doctorate of Optometry from The New England College of Optometry and is currently on maternity leave. During Andrew’s time in Winnipeg, she served as a Board Member for the Winnipeg Jets True North Foundation (WJTNF) for five years, acting as the liaison between the wives and girlfriends of the team and the Foundation. She also worked with wives and girlfriends in various initiatives in Chicago, Atlanta, and Winnipeg, including helping to organize numerous game-day fundraisers. Through her leadership, a team cookbook was published and sold, with funds directed to the WJTNF. Now, Andrew and Brandy are working side-by-side through their efforts with the Ladd Foundation. The first Ladd Foundation event, Fishing 4 A Cause, will see proceeds go to the Rick Hansen Foundation and the Fraser River Sturgeon Conservation Society. Taking place in British Columbia from July 18-21, the event includes Sturgeon fishing with an NHL player, a group that includes Ladd, Duncan Keith, Mark Scheifele and Tyler Myers. “Obviously, we can help raise money and awareness for people with disabilities, while also shining the light on Sturgeon conservation,” said Andrew. “We wanted to have an event that was unique. The NHL players that come, people will have the chance to talk to them, get to know them, and hopefully, get a lot out of it. It’s something Andrew and Brandy Ladd are reminded of often, even more so with the launch of the Ladd Foundation.